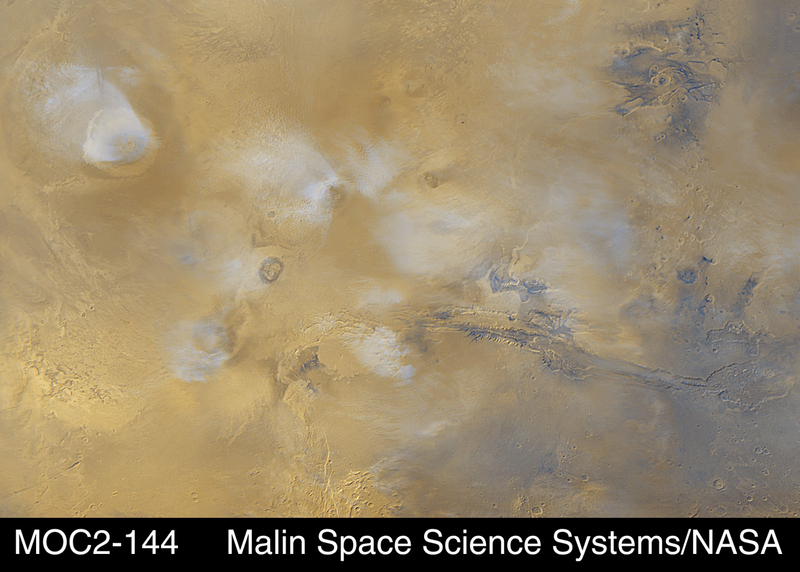 This excerpt of a Mars Global Surveyor Mars Orbiter Camera daily global color mosaic shows typical afternoon clouds over each of the large Tharsis volcanoes (left). Clouds are white and bluish-white features in this image. Olympus Mons is in the upper left corner. The three Tharsis Montes run diagonally from upper center toward lower left--in order,they are Ascraeus Mons, Pavonis Mons, and Arsia Mons. Together, the three Tharsis Montes cover an area that would stretch down the west coast of the United States from the border between Washington and Canada at the north end to the Mexico/California border in the south. 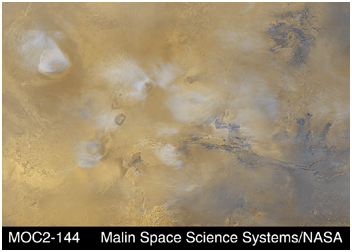 The Valles Marineris--a giant system of chasms and troughs--stretches across the center right side of the picture. The Valles Marineris would stretch all the way across the United States, from Los Angeles on the west side to New York in the east. This is a portion of the global image shown in MGS MOC Release MOC2-143. The mosaic shows images from a single day during the martian northern summer in April 1999.